The world is full of mysteries. It's up to your group of intrepid teen sleuths to solve them. 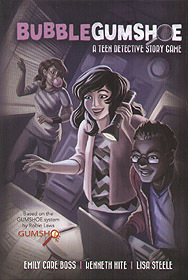 In Bubblegumshoe, players step into the shoes of highschoolers solving mysteries in a modern American small town. Discover clues, solve problems, and throw down with enemies in this streamlined RPG based on the GUMSHOE system. A variety of short mystery starters, including a full introductory mystery: Hey! That's My Bike!